Just back from a great family trip to Northern California. My husband was born and raised there and four of our five children were born there. I lived there for 13 years. Welcome to Northern California Week at Red Couch Recipes! I will be showing you the highlights of our Northern California trip and providing recipes inspired by the sights and tastes of Northern California. Also welcome to Blue Week at Jenny Matlock's Rainbow Summer School. You can't get much bluer than blueberries! 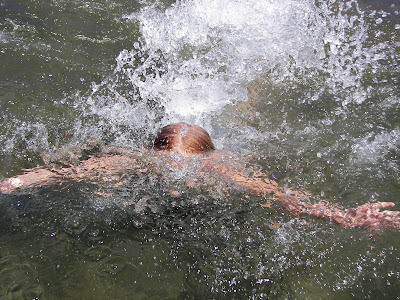 Our first stop on our trip was to swim in Lake Tahoe. Lake Tahoe is a great place to spend a day. 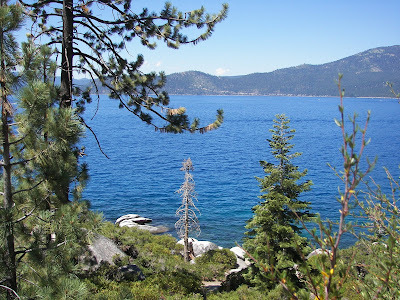 When we lived in California, Lake Tahoe was a favorite! The water is clean and clear! It is the second deepest lake in the United States. Come early because parking gets filled up quickly! The water is a bit chilly, but not too chilly for me! Apple Hill...Apples, Berries and a Whole Lot of Fun! Leaving Tahoe and coming down Highway 50 we drove around the windy roads of Apple Hill. 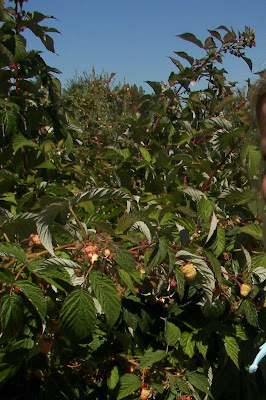 Apple Hill is a collective of 50 different farms that sell apples, of course, and blackberries, raspberries, and blueberries; some of the farms offer U-pick. We used to live about 20 minutes away from Apple Hill and went there often. Although some of the farms are open all summer, Apple Hill really gets kicking in the fall with pumpkins, cider donuts, unpasteurized apple cider (yummy), and pies. On the weekends, there are arts and crafts for sale. We almost didn't stop to pick any fruit until my youngest said that it "would wreck the trip, " if we didn't. She was right....we loved picking and eating these berries fresh off the bushes! Freshly picked Apple Hill Blueberries! Years ago I acquired this recipe for Sour Cream Blueberry Pie from one of the farms at Apple Hill, Bolster's Hilltop Ranch. 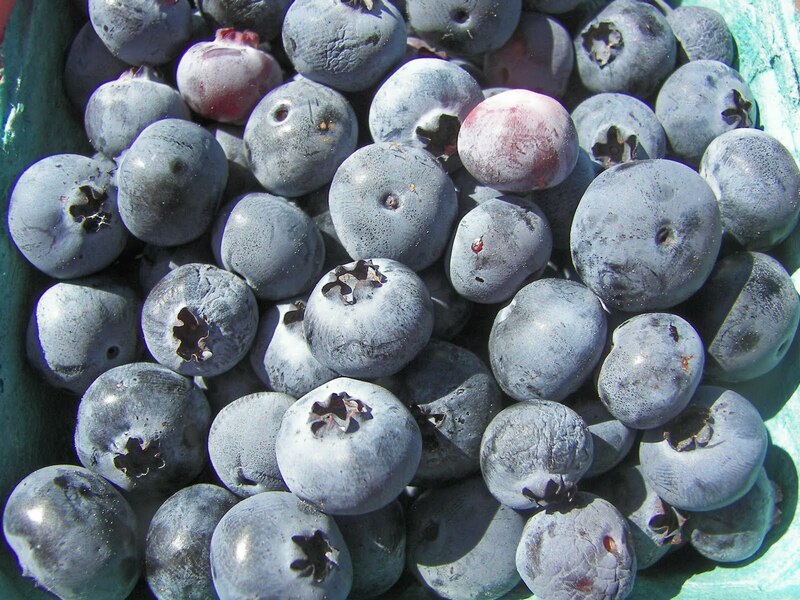 They hold a blueberry festival at Bolster's each year in June. It is a delicious pie recipe. Inspired by the mini pies in Mason jars made by Yvonne at Stone Gable, I made the pies mini-sized. 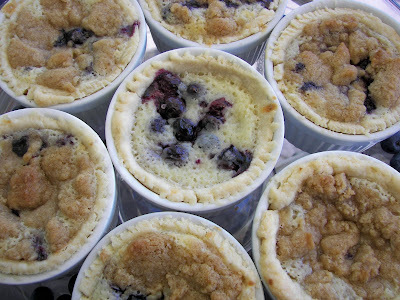 I used my 6-ounce ramekins and the recipe made 8 lovely little pies. This pie tastes best if stored in the fridge overnight; the flavors meld together and it is wonderful! 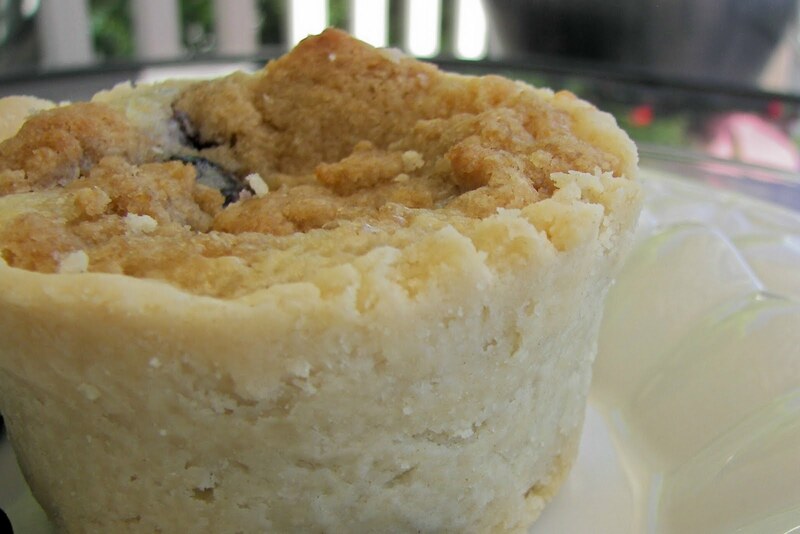 It is a scrumptious creamy version of blueberry pie. If you don't have blueberries, you can use another fruit. 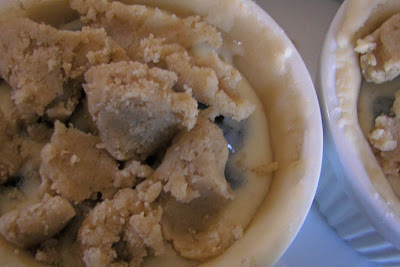 Instructions for Pie Filling: Combine flour, salt, and sugar in a large bowl. In a separate bowl mix the egg, whipping cream, apple cider vinegar, and vanilla together. Slowly combine the sugar mixture with the whipping cream mixture. Mix until smooth and then add the blueberries. 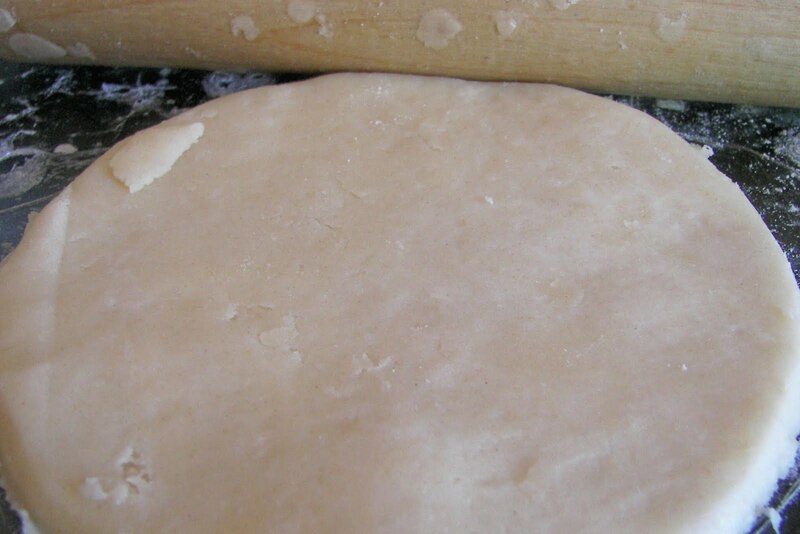 Make the pie crust and roll out flat. Cut out pie rounds that are bigger in size , by at least 1/2-inch, than your ramekins (I used my 10 ounce Pyrex bowls). 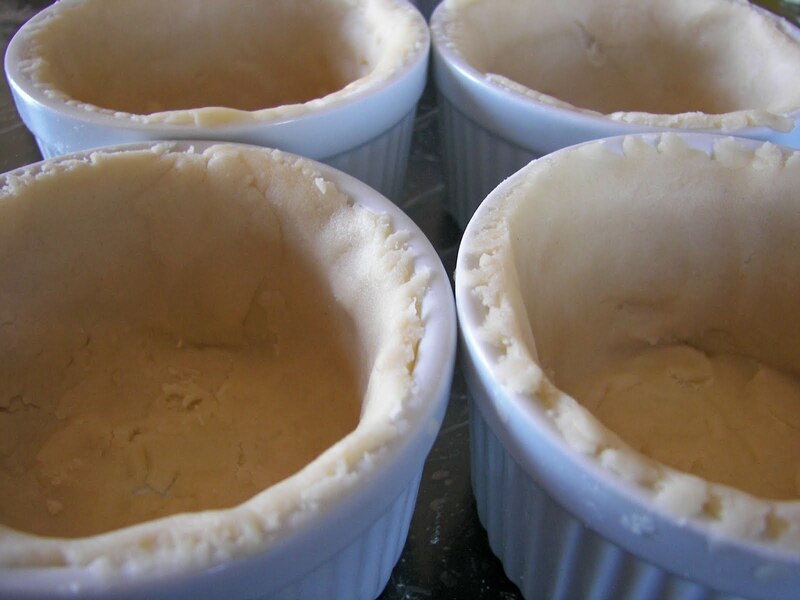 Place crust in bottom of ramekin, pricking bottom with a fork. Add around 5 tablespoons blueberry pie mixture to each ramekin. Instructions for Crumb Crust: Mix the butter, flour, and sugar until it is mixed well and resembles large cracker crumbs. 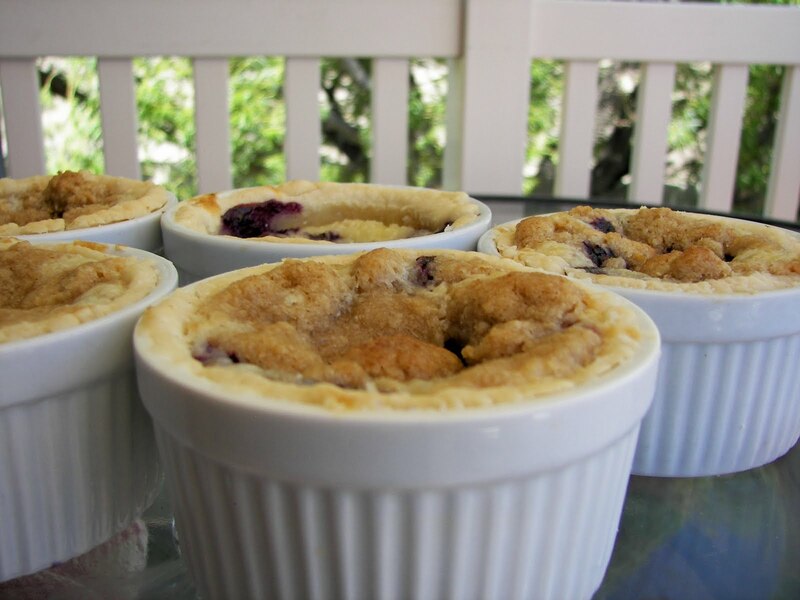 Top the ramekins with crumbs. Baking Instructions: Bake for about 8 minutes in a 425 degree oven, then reduce heat to 350 and then bake for about 20 minutes more. Cool. You can invert these and serve without the ramekin or serve in the ramekin. You can also make this pie in a 9-inch pie pan,, but I just love the minis! Now let's cut into the pie and take a little wedge! Thank you for dropping by and joining me on my Red Couch for Northern California Week! Hope you like the pie....it is a winner in my family! Oops, I spilled a little blueberry pie on the couch....and you KNOW how blueberries stain so I better say good by until tomorrow where we will continue our trip in Northern California to the city where we DID leave our heart! Your little pies look delicious and I LOVE Apple Hill. My hubby grew up in the are and his mom lives in nearby Rocklin. Cant wait to hear more about your N. Ca. trip! sounds like a wonderful trip! I love making desserts in individual sizes- I think it seems more "special"- great job! Oh my goodness, Joni! Those blueberry pies look so good! Loved your vacation pics and story too. Glad you had fun. Everyone needs to get away. Welcome back! You've been missed. I'm so glad you had a happy vacation at some of my favorite places too. Your berry pies are adorable and look tasty too. I look forward to trying your recipe and reading more about your trip. What a cute idea for the pies to make them in the ramekins. Tally's pic is great. Can't wait to hear about your trip. Make these for Sunday dinner and come up this week. I am going to have to make these mini pies in ramekins. Your crumb topping makes them, I wanted to eat the raw crumbs. Oh my Gosh! That pie looks like heaven. I will have to try it. I did a post Joni about wining the salad dressing. Thanks for the chance to win. They were all delicious dressings. lake tahoe rocks! looks like you had a great trip. my great aunt used to make a sour cream blueberry pie that i LOVED--but never made myself. the idea of making small ones is perfect...that way i could freeze them and not over-indulge! thanks for linking up to tnsc! I've never been to California...we always seem to stay on the other coast. It looks gorgeous and I love this recipe. I really like how the pies can pop out of the ramkins for serving. I'm saving this one. Do you think it would work with apples? such a great idea to make individual pies. . . looks yummy!! Joni, I've never heard of Apple HIll and I think I need to go there this fall. Where is it located (nearest town). I'm so glad you had a great trip? Would this recipe work well with raspberries. It sounds delicious. Looks so delicious! I would love a cup of coffee and a ramekin, please. You have a blessed family to receive this great treat. Joni, Your trip sounded like a fabulous getaway. ANd your pictures beautiful! YOur little pies are adorable and they look delicious! I like how they can be popped out of the ramakin and placed on a plate. The recipe makes me drool! YUMMY! 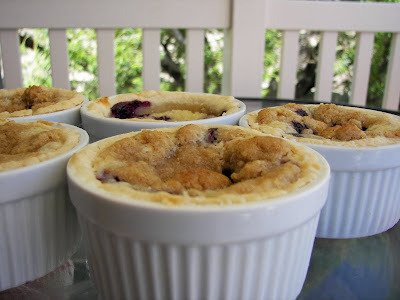 I love to find another use for ramekins - and I love blueberries! Anything that tastes better made ahead of time is also welcome! These are simply fantastic. I am big into minis. They even taste better when they are small or so it seems. I'm glad your vacation wasn't wrecked and you managed to pick those blueberries. The pie sounds delicious! The photos of Lake Tahoe are just gorgeous. It's funny what makes a trip memorable for kids, glad you got to stop and pick berries. Because that pie looks and sounds amazing! Very beautiful pictures of Northern California. I've never been to CA, so I always love posts that show me something new about a place. That recipe definitely does sound yummy. Everything looked wonderful. 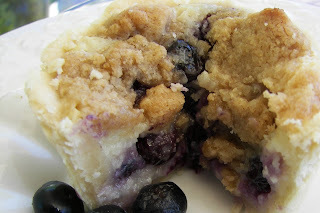 I have always wanted to go to Lake Tahoe...someday:) Great looking recipe too...I love blueberries. Yummy! I love a good blueberry pie or blueberry pancakes or blueberry anything! Your trip was picture perfect. Thanks for sharing. I am came by way of Alphabe Thursday and Summer School blues! To eat wonderful pie in this setting would be like heaven. Sounds yummy! And what can be bluer that blueberries!? Interesting to read about your journey back to Northern California. Pretty travel pics. Beautiful Lake Tahoe pic. The blue berry pies sound yummy! Oh, that pie is tempting as can be. And Lake Tahoe is even more so! Oh wow, Lake Tahoe! I haven't been back there for ages! Love the photo you took! Wow, those treats look like they're worth every single calorie! Nice to see vacation pictures, too. I always enjoy that when blog-hopping. How lovely to see you celebrating Northern CA! I can't actually imagine swimming in that cold water at Tahoe though it is one of my favorite places to visit....so beautiful. We have had two days of nearly 90 degree weather this past week in Daly City ( near the San Francisco airport - most unusual - I am happy to have it back to cooler 70 degrees. Your blueberry pie looks supreme...can't wait to try it!! 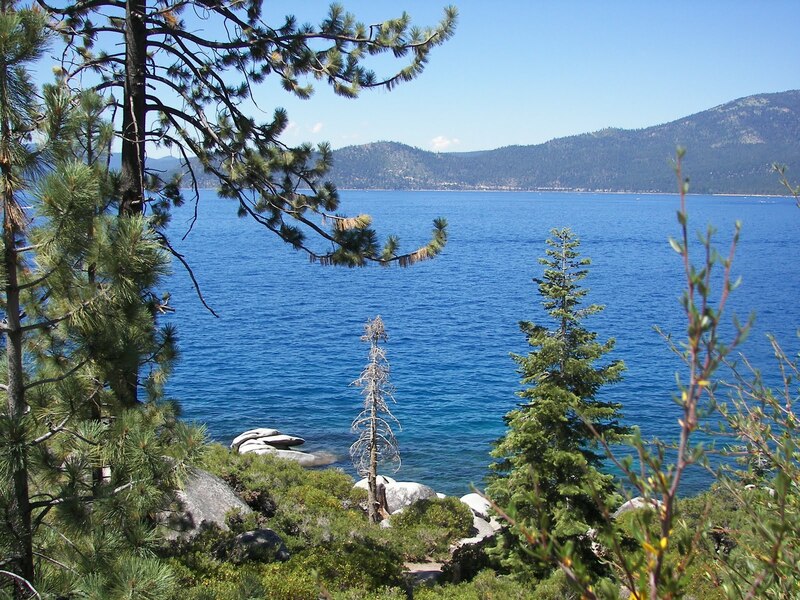 I love California and Lake Tahoe is lovely! I remember the first time I visited, I came across some steep cliffs and through the fog I saw the west coast for the 1st time! WOW! I will have to try your blueberry pie, we have lots of berries that we picked and I needed a good recipe! Thanks! I'm just thinking the best way to hear your vacation stories might be in person. While I'm eating one of those scrumptious looking pies. Oh my. They look amazing. I used to make a crumb pie with sour creams and raisins but this looks even better. Thank you for this whole wonderful post.